The IRDG Norman Sheppard Award was initiated in 2012 on the occasion of the 200th meeting of the Infrared and Raman Discussion Group and is awarded annually in the field of vibrational spectroscopy. Professor Sheppard FRS had a distinguished academic career using vibrational spectroscopy to study molecular structure and dynamics particularly focussing on the identification of surface intermediates on catalysis surfaces. He started his career at Cambridge University until he moved, in 1964, to the newly established University of East Anglia. He attended the first IRDG meeting which was held at the Royal Technical College, Glasgow on 20th January 1950 and was a regular attendee and contributor at meetings, including the 200th meeting in 2012. Norman Sheppard passed away, aged 93, on the 10th April 2015 and an obituary was published in the Guardian newspaper. 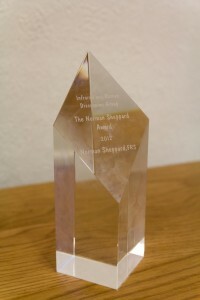 The Norman Sheppard Award for Vibrational Spectroscopy is usually presented to the recipient at the Christmas meeting of the IRDG. For further details on the award and information on the nomination and selection process, please visit the award details page.